This bracelet could be worn casually and occasionally depending on one's dress sense. I particularly like the color and the fact that it looks more expensive than it really is. Stay fashionable and trendy with this handsome and sturdy leather bracelet. 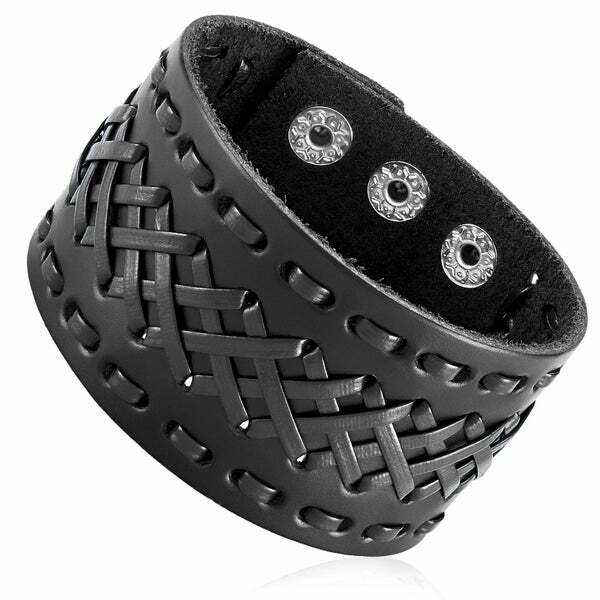 This jewelry item features a wide leather cuff with accent stitching on the center of the strap. This wide leather bracelet is flexible and contours well onto the shape of your wrist for a comfortable wear. This bracelet measures 8 inches long by 42mm wide by 4mm thick, weighs 22 grams, and secures with a snap clasp. Dimensions 8.04 In. X 1.66 In. X 0.16 In. Well made . Generous gage of leather . The quality is good, but the leather could be thicker. There is a slight cheezy look to them, but overall satisfied with purchase. My husband really likes his bracelet. Would certainly buy again from Overstock. Excellent fit, feels great, I Love it...looks good to!!! Looked cool so I bought it. History of Bracelets from Overstock.com. Our guides provide customers with information about bracelets. Tips on Wearing Bangle Bracelets from Overstock.com. Our guides provide customers with tips on wearing bangle bracelets. FAQs about Bracelet Fit from Overstock.com. Our guides provide customers with answers to frequently asked questions about bracelet fit.